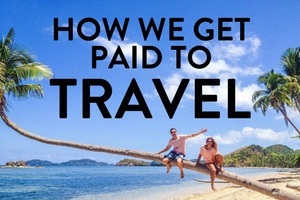 One of the main reasons why I travel is because I love experiencing various cultures and traditions. While traveling through a country is one thing, taking part in local festivals is a real highlight and is one of the best ways to get a glimpse into a country’s culture. Everywhere around the world, there are various festivals going on. From big music festivals to incredible celebrations that have stood the test of time. While I could easily name all the festivals around the world, here are a few of the highlights that you need to add to your festival bucket list! Celebrated in Thailand and some other Asian countries, Songkran is one of those celebrations that are just downright ridiculously fun! The Thai’s usher in the New Year, cleansing themselves of the things that have happened in the past and preparing themselves for the New Year that is about to come. To Westerners who are merely taking part in the parade, the entire thing seems like just one big party but the locals who take part in this celebration go through a lot of various religious rituals as well. 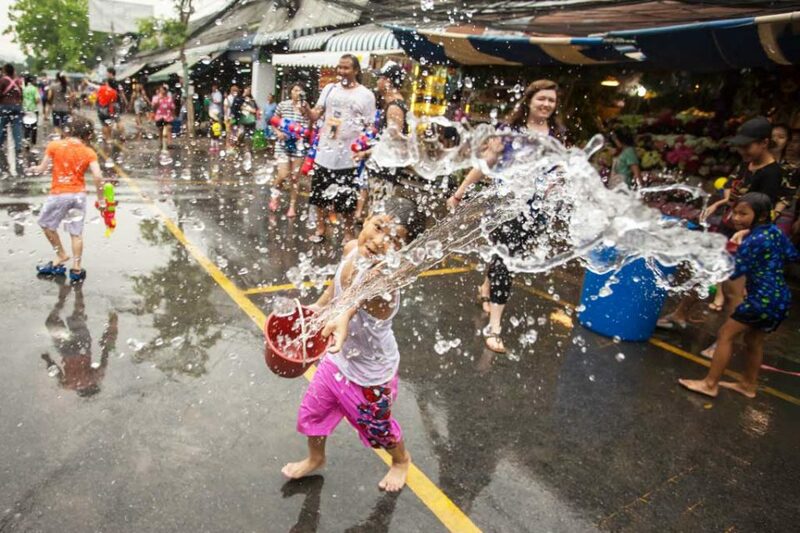 In Chiang Mai (which is one of the best places to be during Songkran), locals gear up in colorful clothing and equip themselves with giant containers of water, water pistols, and buckets filled up with ice water to dump over unsuspecting bystanders. If you are heading to Thailand, Songkran is definitely a festival that I recommend you try to squeeze in your schedule. 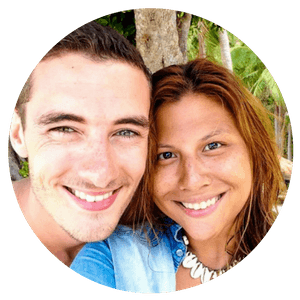 Insider Tip: Although Songkran is a super fun festival, I do urge you to be a bit cautious as there is an alarming amount of drunken accidents during this period. Avoid taking public transportation (long bus rides) and we recommend that you walk to places instead. This Spring Hindu festival is one of the most colorful and fun celebrations around the world and is typically celebrated in India and Nepal. If you ever get the chance to experience Holi, I urge you to do it! During this festival, people typically wear white and parade in the streets, soon after this turns into a giant street party with people throwing colored powdered dye at each other. Signifying the coming of Spring and the victory of good over evil. Depending on where you are, water guns and water balloons are also used to play and drench each other as part of the celebration process. 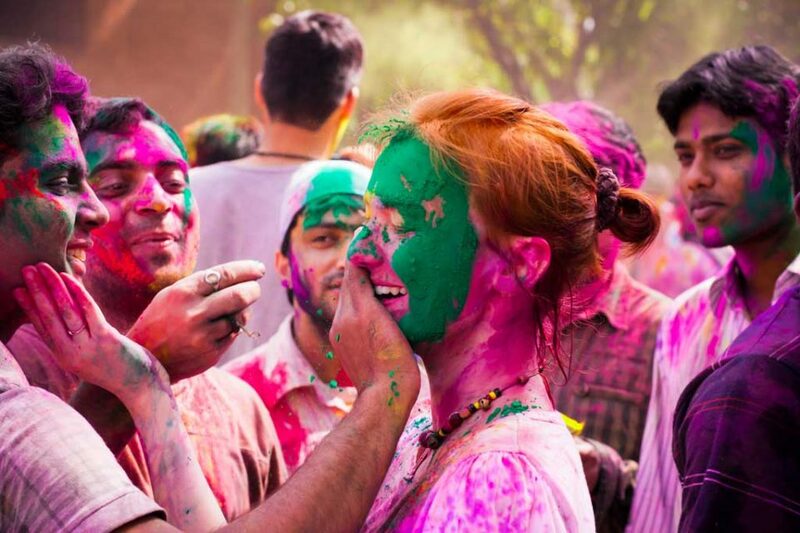 Although Holi originated in India and is widely celebrated as a religious festival, it has been adopted in many places around the world and is often incorporated into fun runs, music festivals, and other events. In 1944, two men began throwing tomatoes to signify their political protest and since then, this tradition has carried on except it is now done for entertainment and enjoyment purposes rather than political turmoil. Due to its popularity, visitors from all over the world flock to Buñol, a small town in Spain to take part in this giant food fight. Over the years, officials have had to create rules to help keep some resemblance of order during this no-holds-barred tomato throw down! Usually, the fight lasts for an hour or so and after, the town square is liberally covered with tomato debris. A firetruck then comes and hoses everything down but the partying and merrymaking goes on afterward. 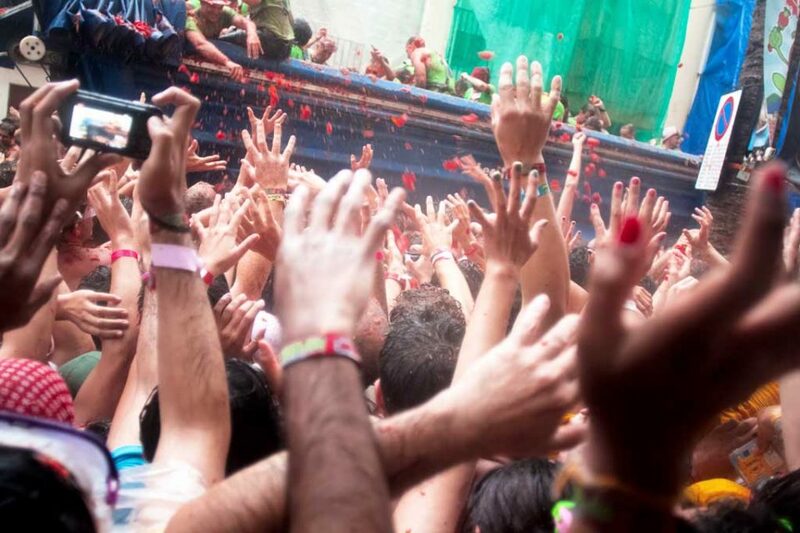 If this is something that interests you, check out the La Tomatina Trip by Stoke Travels for some seriously good tomato-throwing fun! When: Late September leading up to the first Sunday in October. For all you beer lovers out there, the Oktoberfest in Munich, Germany is a one of a kind celebration that NEEDS to go on your bucket list. Known as the biggest Volksfest (beer festival) in the world, this 16-18 day festival consists of non-stop drinking, merrymaking, and eating. While it seems like its just a month-long excuse to get sloshed, Oktoberfest is an important part of Bavarian culture and has been celebrated since the Middle Ages. Other cities across the world also hold Oktoberfest celebrations that are modeled after the original Munich event but if you want the real deal, head to Munich and be prepared for a few nights (and days) of partying. Insider Tip: The month of September gets insanely busy so if you are planning to join the festivities, I highly recommend that you book your accommodations in advance. 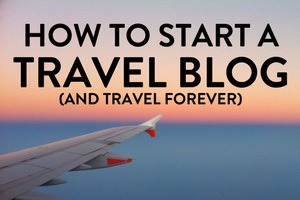 Believe it or not, hostels and hotels book out months in advance during this period so better be plan ahead. 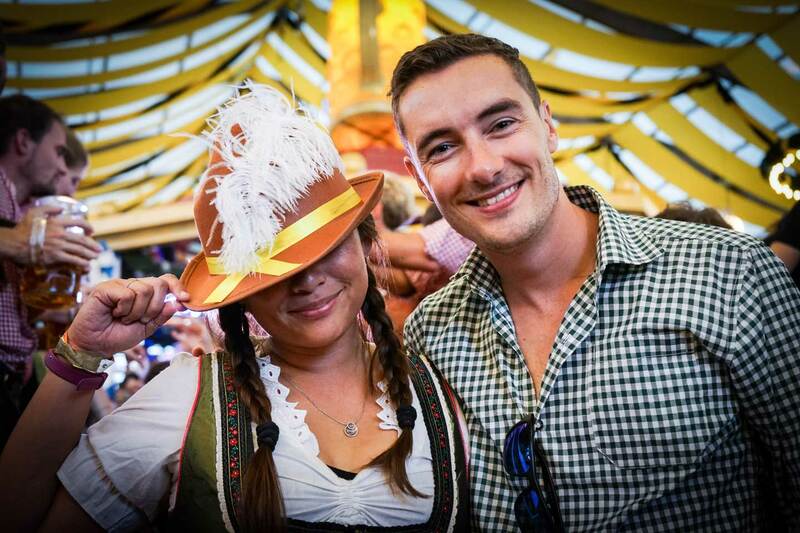 Check out the Oktoberfest by Stoke Travel to book an experience of a lifetime! 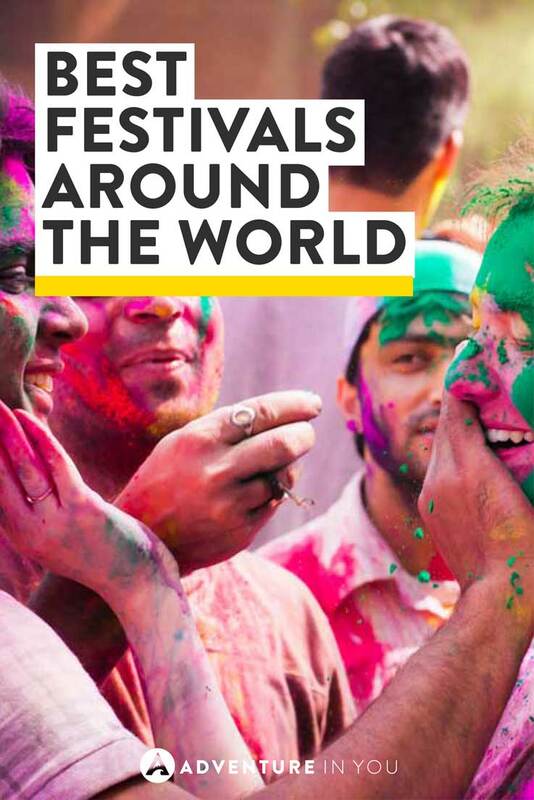 While this particular festival isn’t as cultural compared to others on this list, it’s still a sight to see! Imagine watching the sky as hundred of colorful hot air balloons float above you. Over the years, this festival has grown and grown and now has programs, light shows, laser shows, and of course, lots of hot air balloons. 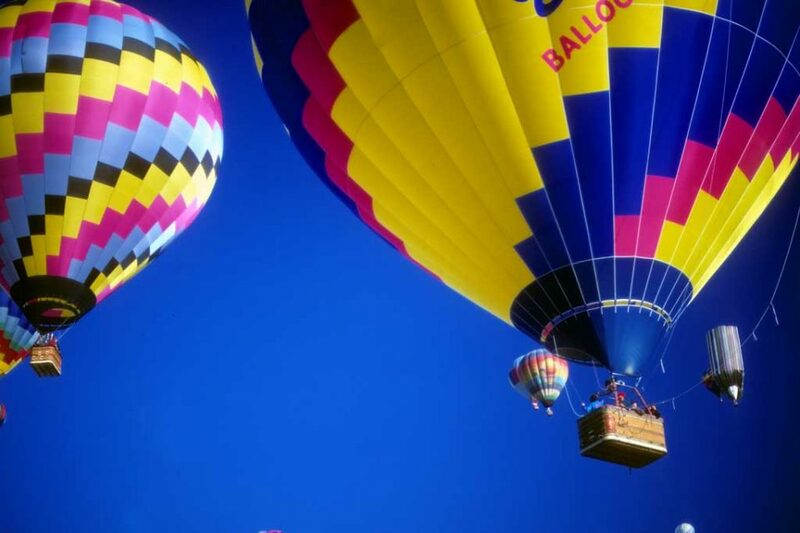 Known as the largest gathering of hot air balloons in the world, you will be sure to capture heaps of colorful snaps throughout this festival. Carnaval started as a way to commemorate Lent- a tradition where Roman Catholics and some Christians abstain from something which at that time, was often meat or poultry. Coming from carnelevare which means “to remove (literally, “raise”) meat, this tradition has since been born. 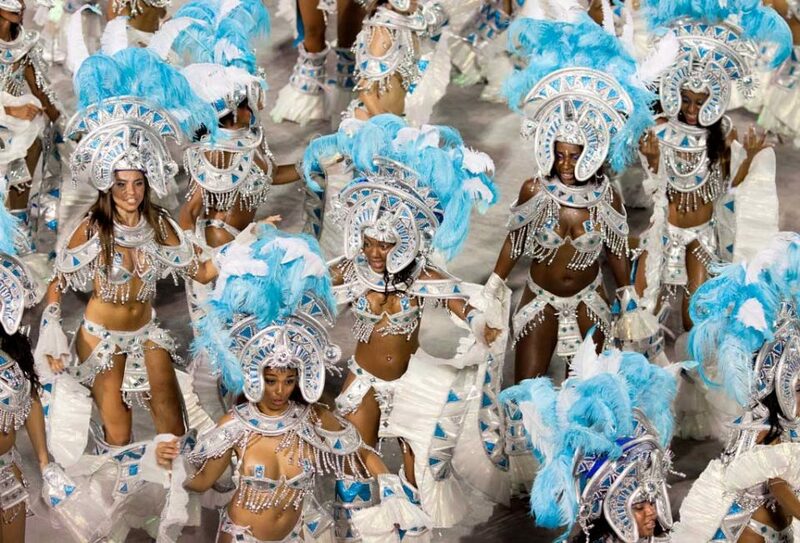 The streets of Rio de Jainero come to life during this five-day celebration. 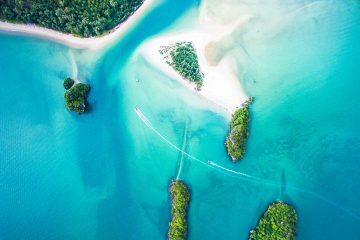 Colorful parades, floats, and non-stop samba dancing-complete with colorful costumes fill this place up, making it one of the best festivals around the world. Aside from the flashy parades, you can see the locals and streets come to life as people from all walks of life celebrate and dance the night away! 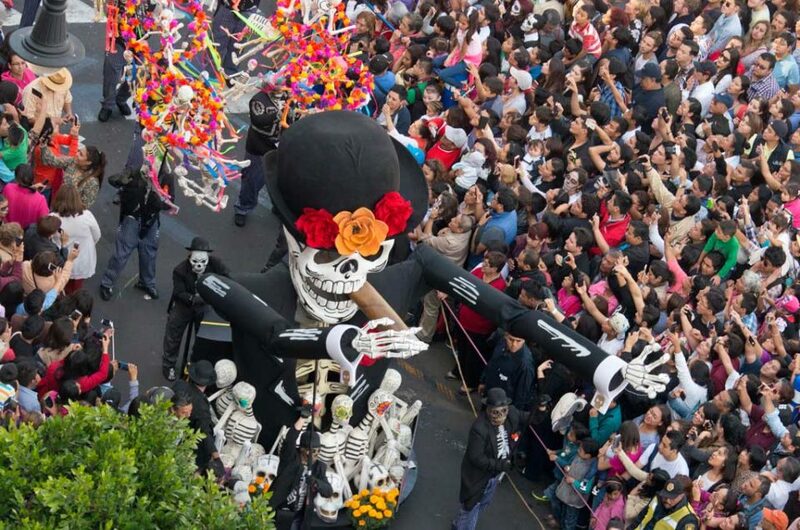 Known as All Saint’s Day, Dia de los Muertos is a huge celebration in Mexico and other parts of Latin America. The festivities were dedicated to a goddess known as the “Lady of the Dead” and is honored with parades, altars, and offerings. The Spanish believe that during this day, the spirits of your ancestors come back to life to visit their loved ones. 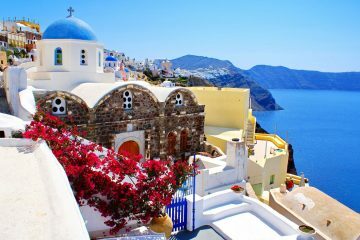 During this time, there are street parades and religious processions as you wake up the spirits for a festive celebration. Every March 16, Irish people from all over the world celebrate this momentous day as they honor St Patrick, one of Ireland’s patron saints, who ministered Christianity in Ireland during the fifth century. During this day, people gather together, wear something green, and eat food that is dyed green! 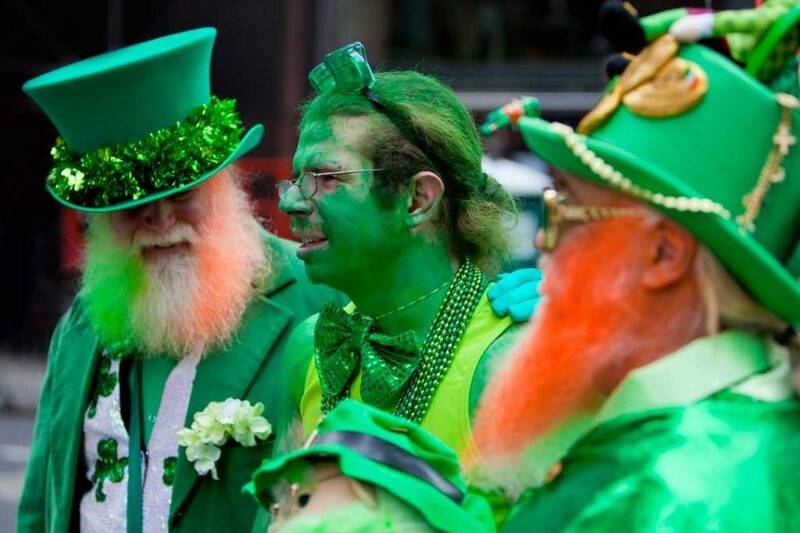 In Ireland, this festival can get pretty nuts as you get street parades and big parties in pubs. One of my all time favorite festivals is the Yi Peng (Yee Peng) Lantern Festival celebrated in Chiang Mai. Having experienced this for myself, this festival of light is really one of the most magical experiences ever. Imagine yourself gathered around the moat and other parts of Chiang Mai’s historical old town as you watch thousands of paper lanterns being set free in the sky. 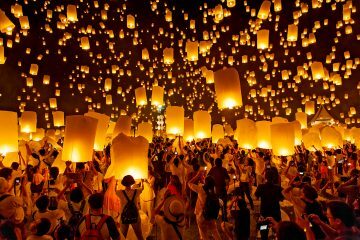 Celebrated at the same time as Loi Krathong, The act of releasing the lantern and Krathong (water float) symbolizes letting go of all ill feelings, resentment, and misfortunes from the previous year. During this time, the streets are usually packed with street vendors, lanterns, and parades. 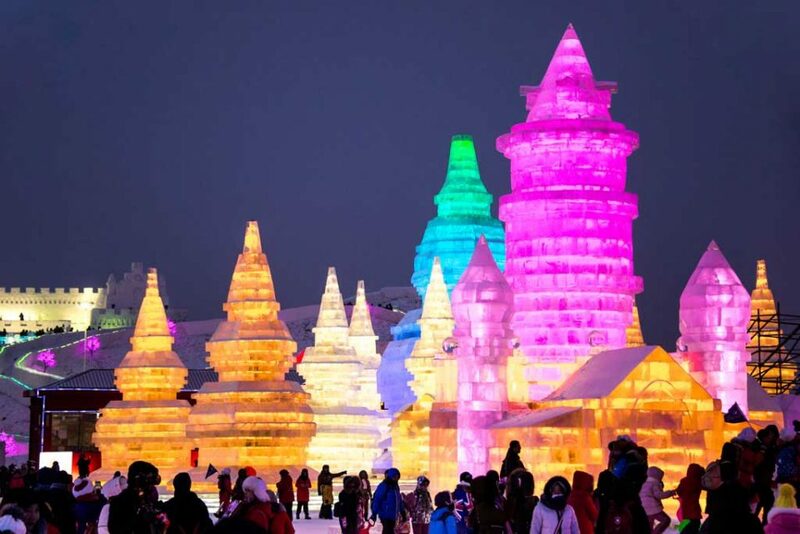 Known as the largest ice and snow festival in the world, every year, thousands of tourists flock to Harbin, China to take part in this Winter celebration. What started as a local festival, it has now grown into a large International celebration featuring ice sculptures from all over the world. If you enjoy looking at intricately designed ice sculptures and looking at unusual works of art, this festival is one you wouldn’t want to miss! When Burning Man festival first started, it was the first of its kind. Unlike other large music festivals whose main purpose is to make money, Burning Man is the complete opposite. As soon as you get to the festival grounds, no money is exchanged. Instead, you have communities of people bartering their skills, getting to know each other, and celebrating life, art, music, and freedom. The entire festival is based on ten principles and is an art sanctuary built in the middle of the Nevada Desert. 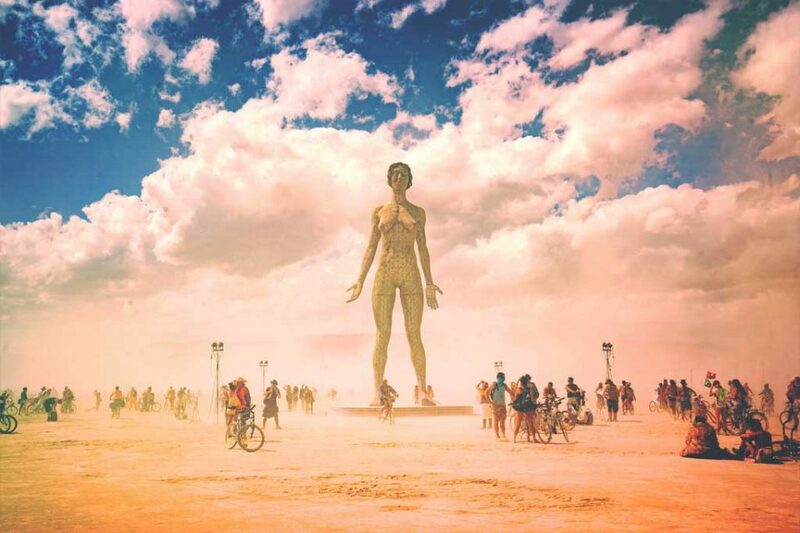 With the entire experience full of non-stop music, partying, and funky art installations, Burning Man Festival is on top of my list and is something that I would love to experience! 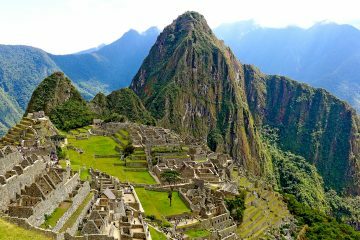 While there are many other festivals that are worth noting, here are a few of the best ones that you need to experience at least once in your lifetime!